10 Unusual Uses of Toothpaste! Sink shiner, Shower door, goggle and headlight defogger: a little toothpaste rubbed onto these surfaces helps buff them and make them shinier and more cleaner than before. Removes scratches from DVD: rub some toothpaste on a DVD and work it from centre outward with a microfiber cloth to remove minor scratches. Gold and Diamond sparkler: shine your gold and diamond jewellery with toothpaste and a soft bristle brush and dry out with cloth. Plastic bottle deodorizer: deodorize your plastic bottles with toothpaste by brushing the insides of the bottles with it. Stain remover: be it the toughest stains on your favourite clothes, toothpaste is the superhero! Just rub the toothpaste vigorously on the stain and throw it in the washing machine, don’t apply whitening toothpaste on coloured clothes though! Iron plate cleaner: when the iron plate gets stained and gunky with mineral buildup, clean it with toothpaste and a dry cloth when it is cool and unplugged. Silver polisher: silverware, forks and spoons, candlestick holders all can be made a sgood as new with toothpaste. Just rub it in with a toothbrush and a cloth for that sparkle and shine. Hand freshner: ever felt that you need to rethink peeling the garlic or handle the bleaching liquid because they leave a strong odour on your hands? No worries now that you can rub toothpaste on your hands and use like soap. Shoe shiner: shoes get scuffs with regular use, just buff them with toothpaste to remove the scuffs. Removing crayon marks from walls: rub in the toothpaste on the marks your child left on the wall and watch them disappear! 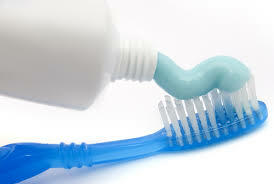 With so many effective uses of toothpaste apart from brushing, who needs to worry about the smaller issues in the house!